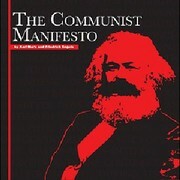 The Communist Manifesto is a Marxist screed published by Karl Marx and Friedrich Engels in 1848. Originally written in Marx's native language German, it lays the foundation for Marxist thinking, teaching that class struggles are the origin of all progress in society. This concept of conflict between the classes dictates Marxism's adherence to the evolutionary theory of punctuated equilibrium, which accords with Marxist social beliefs. The manifesto outlines the theory of communism, in which the poor working class proletariat violently overthrow the middle class and the wealthy property owning bourgeois. Once in power, the primary goal of the proletariat is to "wrest, by degree, all capital from the bourgeoisie, to centralise all instruments of production in the hands of the State". The Manifesto influenced the Communist Revolution in Russia and elsewhere, leading to the Cold War and numerous atrocities committed throughout Eastern Europe, such as the Holodomor in Ukraine. Currently, China, Cuba, North Korea, Vietnam and Laos are widely considered to be communist countries. This page was last modified on 17 April 2019, at 21:00.